I would highly recommend Barrie Preece as a driving instructor. my first lesson I was a bag of nerves, not ever driven a car before, however Barrie soon put my nerves at ease, I started to feel confident in my ability to drive and again knowing Barrie was there by my side was a good feeling. I enjoyed every lesson feeling more confident everytime. Then before I knew it Barrie was booking my test, not feeling very confident in myself but again Barrie to the rescue. I said to myself I must be ready if Barrie believes I am, test day came nervous wreck, talking it over felt a bit more at ease. Passed first time with 3 minor faults and still can't believe it was so grateful. 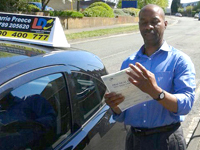 I do feel you have to have confidence in your instructor, with Barrie that becomes very easy. I have wanted to drive for so long now I can. When you do pass your test I would again highly recommend the motorway lesson, I waited for my lesson before attempting the motorway, I felt so more at ease and confident after the lesson. Again I can't thank you enough Barrie for teaching me and helping me get through my test first time, I do miss our laughs, also please get some little Barrie dolls made up :)) you are welcome to add to your website for for anything else. I just wanted to thank you for your care of my girls while they were learning to drive. Taking time to develop into good and safe drivers was key to a positive outcome for me. I wanted them to be ready to cope with whatever difficult driving conditions they may encounter when they are out on their own. It may have cost a little more, but I regard it as a worthwhile investment in their safety and that of other road users. I believe my girls have been taught to a high standard relevant to the driving conditions of the modern world, without any of the tension that may have emanated from teaching them myself! We were able to go out to practice what they had learned in a remarkably relaxed way, as they were confident in what they had been taught. By adding on lessons in motorway driving, I feel we have done all we can to give them the skills they need to be safe. By driving all over the place and not just on the test route, you have given the girls a breadth of experience which I hope will stand them in good stead. The girls genuinely enjoyed their lessons and the conversation. They have a wicked sense of humour and I think you found the right tone with them! It also worked really well for them to be able to study before the lessons and to know what was expected of them. I have heard many bad stories about learning to drive. I am happy to say that has not been our experience. I'd recommend this too, Leigh is more confident to drive on the motorway now... and I am a happier mum knowing she knows what to do! I passed my driving test first time, and honestly don't think I could have done it without LDC well-structured lessons approach. Barrie engineered everything in a friendly and professional way that learning to drive was an amusing experience to me. Thank you very much for all your contribution towards this achievement. Barrie was friendly and professional throughout the Pass Plus. He arranged to meet up before the day so that we could go over what would happen, when and why. He also gave me supplementary material to help me both before and after the Pass Plus. The day itself went smoothly, and I got exactly what I needed from it, and more. He remained calm and attentive throughout, regardless of how well or poorly I was doing. Honestly, I would have hated to have gone on a motorway or such a long journey, for the first time, without the guidance he provided. Barrie was an excellent driving instructor, he helped me pass my test first time with only 4 minors through the semi-intensive course. I now feel happy to drive anywhere! I would recommend Barrie, as he has a good coaching technique and a friendly personality. (Although his jokes are terrible!) Thank you Barrie! First time pass, "Thanks for being an awesome instructor". Learning to drive with Barrie from LDC was a real pleasure. Doing an LDC semi-intensive course over 2 weeks was hard work but with the LDC materials which are provided, the help and flexibility from Barrie I found myself learning very quickly and positively. 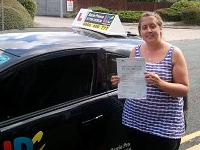 It's nice to have someone to put your mind at ease whilst driving as it can be daunting at times but with Barrie's upbeat attitude and good sense of humour I felt I was having fun on my lessons as well as learning. Passing first time and feeling as confident behind the wheel as I do after just 2 weeks, I would defiantly recommend Barrie as the instructor to have. Barrie was a fantastic instructor. First time pass on an LDC One Week Pass course, between Barries relaxed manner and the LDC course material it was clear to understand everything that was needed and how to apply the theory to the driving. Driving with Barrie was a pleasure with his humour, professionalism and intuitive teaching making the whole experience enjoyable but still informative. I'm arranging to book some more lessons to boost my experience and confidence even more with motorways now and would happily recommend Barrie to anyone looking to learn to drive. 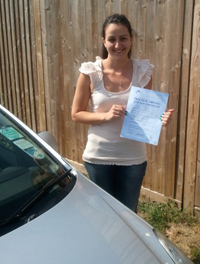 Catriona took the 30 hour semi intensive course and passed first time. "Great style of teaching which is personalised to your own experience and confidence, very thankful and enjoyed the experience!" 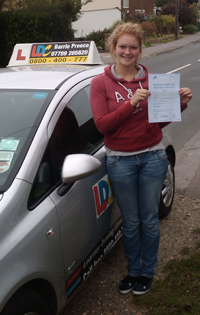 Lucy passed with ZERO FAULTS !!!!! I really enjoyed the structured, step-by-step approach of learning to drive with LDC and the relaxed, patient and (occassionally) funny approach of learning with Barrie. I would recommend it to anyone, particularly if you want to learn to drive in a short space of time as the semi-intensive course over 3 weeks worked perfectly for me!" Barrie was an excellent driving instructor. 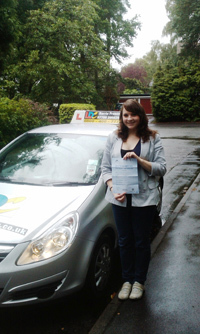 I passed first time and in a period of six weeks and i feel this is due to Barrie's relaxed manner during each lesson. I used to enjoy each lesson as Barrie had a great sense of humour whilst being professional and informative. I would happily recomend Barrie to any learner. 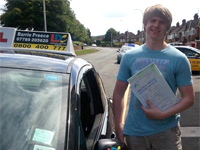 "Barrie was an excellent driving instructor, he made me feel relaxed behind the wheel and his good sense of humour helped too! I know I couldn't have picked a better instructor. I passed my test first time and I enjoyed learning with him. I would not hesitate in recommending him to anyone." "Barrie has a lot of patience and a good sence of humour which resulted in me feeling relaxed and confident in my driving ability. 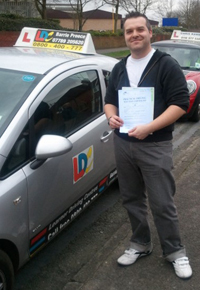 It was definitely a good learning experience and I would whole heartedly recommend him as a driving instructor!" "Learning with Barrie Preece was fun and worthwhile. Lessons were filled with laughter, and I always came away learning many more new things about driving. With the the help of Barrie, I passed my test and it was definitely money well spent on learning to drive with the company LDC and the instructor Barrie Preece. 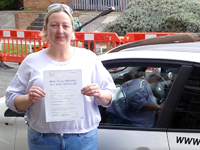 Learning to drive can be a scary and nerve wracking thing to take on, If you want to learn to drive with confidence and enjoy yourself whilst learning, Barrie Preece is the instructor for you!" "I realy enjoyed learning how to drive with Barrie. He was patient and had a good sense of humour. He also lent me CD ROMs and workbooks to help with lessons and passing my Theory.I would honestly reccomend you choose Barrie as your driving instructor!"